Keeping your tires properly inflated is vital to keeping your car running smoothly, and making sure that you and your passengers arrive safely. Checking the air pressure in your tires is easy and there are a lot of products on the market to choose from, but how do you know which one is right for you? Our team performed extensive research on many of the top brands to find out which gauges rise above the rest, and what kind of bells and whistles you might need. From dial to digital, we took into account accuracy, psi range, readability, and more, to create our list of the best tire pressure gauges available. Read more about our methodology. The Michelin MN-12279 offers everything you could want in a tire pressure gauge, at a very affordable price. 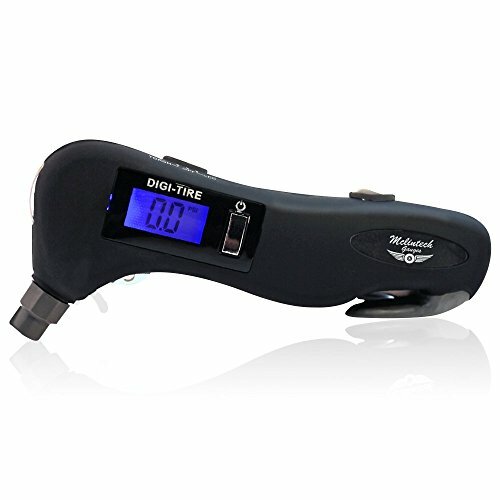 Measuring tire pressure to an extremely accurate resolution of .1 PSI, and offering programmable settings and an LED flashlight, it is a great choice for professional mechanics and car enthusiasts alike. The Northone 100 PSI Digital Tire Pressure Gauge offers the most bang for your buck in a compact, portable, and easy to use device. Featuring 4 tire settings and measuring up to 100 PSI, it is a great option for everyday vehicles and some high-pressure tires as well. 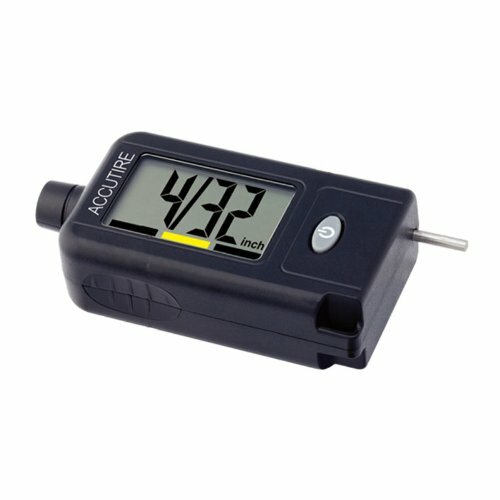 Accutire is one of the best brands available and the MS-4350B is their highest rated gauge. Featuring programmable PSI settings, a large, backlit screen, and a 5 year warranty, the MS-4350B is the perfect gauge for everyday use over a long period of time. The Joes Racing 32307 Tire Pressure Gauge is perfect for mechanics or serious car enthusiasts. With a large, glow in the dark face, a pressure release valve, and 2 versatile chucks, it is great for everyday use without having to worry about batteries. The Astro 3018 is the perfect accessory for any road trip! 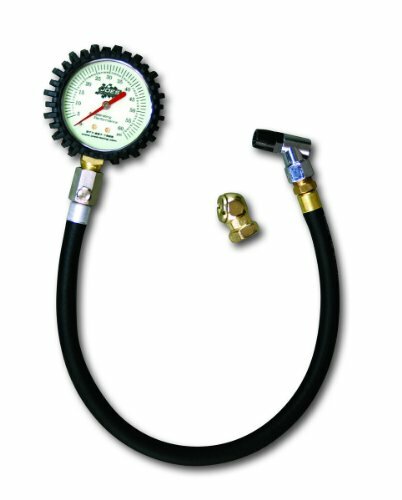 A reliable tire pressure gauge with a lock on chuck allows you to inflate and deflate your tires without the extra effort. Skip the trip to the service station and inflate your tires wherever you are. If your primary concern is safety, the McLintech 5 in 1 Tire Pressure Gauge is the perfect choice. Compact and portable, the gauge comes equipped with 2 LED flashlights, a seat belt cutter, and an window smashing hammer in case of emergency. The Accutire MS-48B allows you to measure your tire pressure and tread depth with extreme accuracy. If you lease your car, this may be the best way to ensure you don’t get charged for overuse. When checking the air in your tires, accuracy is the most important consideration. While many professional mechanics prefer analog, digital gauges can be much more accurate and easier to read. Some digital gauges can even display an accuracy of .1 psi compared to .5 psi, which is common among many other models. The recommended PSI for your tires can be found in your owner’s manual, as well as the tire placard which is attached to the vehicle door, doorpost, glove box, or fuel door. For most cars, the recommended PSI is around 30, but for heavy-duty, high-pressure tires it can be as high as 80-100. In addition to an accurate read, you will need a gauge with a PSI range that accommodates your vehicle’s recommended tire pressure. While you will certainly want a gauge that is compact and portable, you also need one with a face large enough to read. This is another reason why digital is often a better choice. The display is backlit, making it possible to get an accurate read, even in low light. Deciding whether to purchase a gauge with a built-in flashlight—which is becoming more popular among newer models—should also be an important consideration. You can’t predict when you’re going to need a spare tire but you should always have a pressure gauge handy when you do. Depending on the kind of vehicle you drive, you might consider a gauge with additional features, like an inflator, a tire thread depth gauge, or the ability to preprogram PSI settings for front and back tires. While some of these features are not necessary for average drivers, it can come in handy for professionals, car enthusiasts, or anyone who believes it is better to be safe than sorry. Other more common considerations might include an air release valve or an angle chuck that can also be used on motorcycles and other less common vehicles. The price range of top-rated tire pressure gauges is around $10-$50, the majority of them being on the lower end of that spectrum. Generally, specialty gauges equipped with additional features like flashlights, air pressure release valves, and inflators, raise the overall cost but you are getting quite a bit more for your money. If you are looking for a standard gauge, whether digital or analog, you should be able to find something more than sufficient for $20 or less. The Michelin MN-12279 Digital Programmable Tire Gauge features all the bells and whistles you might need in a relatively portable size. 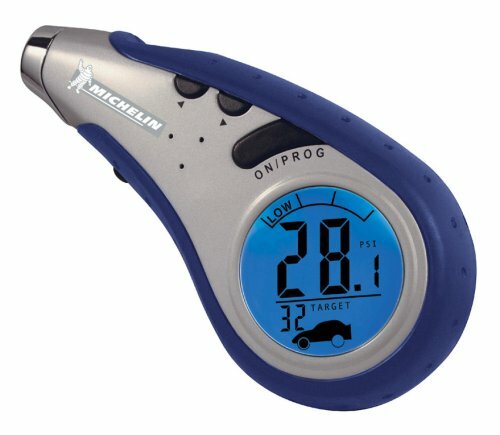 Housed inside a durable metal casing and equipped with an easy to hold rubber grip, The Michelin MN-12279 measures the air pressure in your tires to a resolution of .1 PSI, allows you to preprogram your desired PSI setting for both front and back tires, and features a white LED flashlight to help you locate the air valve in low light. Extreme accuracy. While most digital gauges only offer a resolution of 1 or .5 PSI, the Michelin MN-12279 displays a super accurate resolution of one tenth of a PSI on a large, easy to read screen. Although it is more specific than the average driver might require, it is great for mechanics or anyone hoping to extend the life of their tires. Programmable PSI settings. Many vehicles require a different PSI setting for front and back tires. The Michelin MN-12279 allows you to program your PSI setting for each, so you don’t have to remember. Another additional function that isn’t completely necessary, but it sure beats having to look for the right setting every time you check your tires. White LED flashlight. A built in LED light not only makes it easy to find the air valve in low light, it can actually double as a flashlight, which is often needed when rummaging around for a spare tire in the middle of the night. Durable design. The photos make the Michelin MN-12279 look small and lightweight. While it is still certainly portable, the hard metal casing weighs 11.2 ounces, giving it a durable feeling in your hand that will not break easily. No ball chuck. The Michelin MN-12279 works very well on standard vehicles. But due to the rigid chuck, it is not the best choice for motorcycles or tires with difficult to reach air valves. No air pressure release. The Michelin MN-12279 is an amazingly accurate gauge that is very easy to use. However, it does not allow you to release air pressure while taking a reading, adding an extra step if your tires are overinflated. The NorthONE 100 PSI Digital Tire LED Pressure Gauge is one of the highest rated gauges available in its price point. Weighing only 3 ounces, the device fits easily in your hand or your glove box and features 4 tire settings to help you figure out how much air your tires need. Equipped with 4 easily replaceable batteries and an automatic shut off switch, the NorthONE is a great choice for anyone who needs a standard digital gauge that is going to last a long time. Extremely lightweight. Weighing only 3 ounces, the NorthONE 100 PSI Digital Tire LED Pressure Gauge is extremely compact and portable, making it the perfect budget conscious accessory for vehicles of all sizes. 4 tire settings. The NorthONE does not allow you to program your exact PSI settings, but it does come with 4 preprogrammed settings, offering an easy to follow guide for accurate pressure readings, particularly for everyday drivers. Long-lasting batteries and automatic shut off. All digital gauges require batteries, some more difficult to find than others. 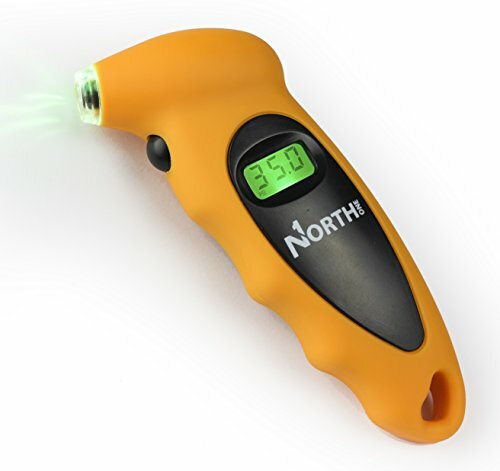 The NorthONE 100 PSI Digital Tire LED Pressure Gauge comes equipped with 1 CR2032 and 3 LR44 Batteries that can be easily replaced. The device also shuts off automatically after 30 seconds to preserve battery life. Maximum pressure of 100 PSI. Many budget gauges only read up to 50 or 60 PSI, but the NorthONE 100 PSI (as indicated in the name) reaches 100 PSI, making it possible to use on larger, heavy-duty vehicles. No ball chuck. The NorthONE 100 is a great option for everyday vehicles, but not great for unusual tires or checking your tire pressure in compact areas where the valve might be difficult to reach. Digital Gauges are far and wide the most popular type of tire pressure gauge for average consumers. They are portable, easy to read, and generally pretty affordable. Often equipped with an LCD backlit screen, they can be easily read in low light, which is a huge advantage when you’re stuck on the side of the road in the middle of the night. Digital gauges can also be more accurate. Many dial gauges only offer a resolution of 1 PSI or .5 PSI. Some digital gauges, however, offer a resolution of .1 PSI. 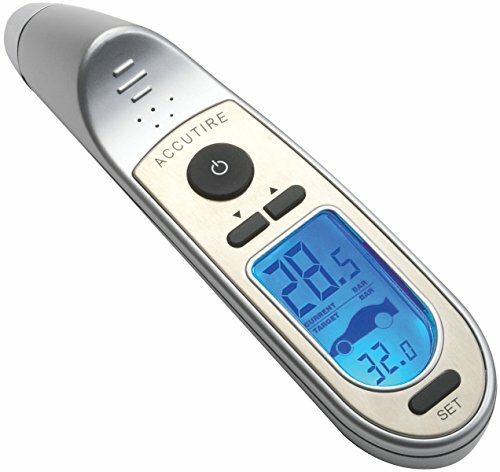 The Accutire MS-4350B Setpoint Tire Gauge is a compact device with most of the features you could possibly want. Weighing only 4 ounces, the ergonomic shape makes it easy to hold and easy to use, features an extra large, backlit screen, and allows you to program PSI settings for both front and back tires. If that weren’t enough, it offers a 5-year manufacture warranty! Programmable PSI settings. With the Accutire MS-4350B, you can program front and rear tire PSI settings to your desired pressure level. Extra large, backlit screen. You can’t get an accurate reading without being able to read the screen. The Accutire MS-4350B comes with a large, blue, backlit screen that makes it easy to get an accurate reading any time of day. Ergonomic “easy grip” shape. Weighing only 4 ounces and equipped with an easy-grip handle, the Accutire MS-4350B is extremely portable and easy to use. 5-year manufacture warranty. Most tire pressure gauges come with a one year warranty on parts (not including accidental damage), but the Accutire MS-4350B Setpoint Tire Gauge comes with a 5-year warranty, making it an extra safe bet. If it’s a dial gauge you are interested in, the Joes Racing 32307 Tire Pressure Gauge is the best option available. With a large, glow in the dark face, both an angled and ball chuck for hard to reach places, a 17” flexible hose and an air pressure release, the Joes Racing 32307 is a great choice for professionals and car enthusiasts who are looking for something reliable and long lasting. Glow in the Dark Face. Unlike digital pressure gauges, dial gauges do not come equipped with a backlit screen, making them more difficult to read in low light. However, the Joes Racing 32307 features a glow in the dark face, making it easy to use at night. Angled & Ball Chuck. The Joes Racing 32307 comes equipped with two versatile chucks that make it easy to use on any vehicle, even in compact spaces. 17" Flexible Hose. With a sturdy but flexible 17” hose, the Joes Racing 32307 can reach any valve from any angle. Air Pressure Release. Equipped with a pressure release valve, the device makes it easy to release unwanted pressure in your tires while simultaneously taking a reading. Not a compact device. The Joes Racing 32307 weighs in at 1 pound, and with a 17” hose, it is not the kind of gauge you can toss in a glove compartment. Max pressure of 60 PSI. While the versatility of the Joes Racing 32307 makes it easy to use on any vehicle, it can only handle tire pressure up to 60 PSI. Any more and you might damage the device. The whole point of using a tire pressure gauge is to know whether your tires need air. If so, you have to head to the nearest service station to fill them up. But with a tire pressure gauge and inflator combo, you can make sure your tires have the right amount of air from the comfort of your own garage. While this does require a little extra effort (and two hands), it can make your life a lot more convenient when you need it most. The Astro 3018 Digital Tire Inflator with Stainless Steel Braided Hose is super accurate and easy to use. The gauge measures a resolution of .1 PSI and displays it on a large, backlit LCD screen, allowing you to take an exact measurement, even in low light. The lock on chuck and convenient inflate/deflate switches make it possible to reach your desired tire pressure from the comfort of your own garage, and with a few easy-to-install AAA batteries, you will have your car up and running in no time. LCD digital read-out. the Astro 3018 features a large face with an easy to read, backlit LCD digital screen, making it easy to use in low light. Extreme accuracy. 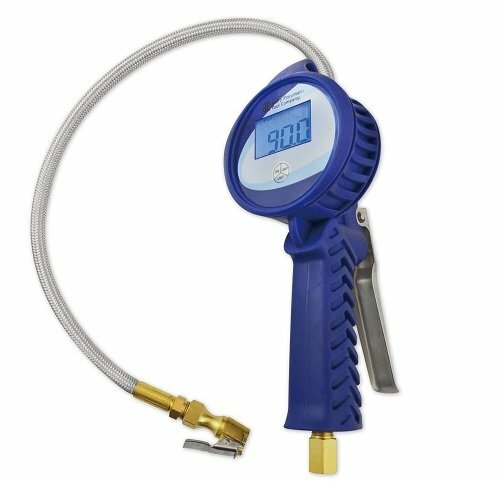 Unlike most tire pressure gauges that offer a .5 percent PSI resolution, the Astro 3018 offers a resolution of one tenth of a PSI for extreme accuracy. Lock on chuck with deflate and inflate positions. With the Astro 3018, you don’t have to stay hunched over to inflate your tires. The lock on chuck allows you to stand up, stretch your legs, and wait for your tires to reach your desired pressure. Easy-to-install AAA batteries. It doesn’t get any easier than AAA. While many digital gauges come with exotic batteries, these are easy to install and even easier to replace. Not a compact device. Weighing in at 1.8 pounds and featuring a 21” stainless steal hose, the Astro 3018 is not small, but is still portable if you have the space. There are plenty of additional features offered with top-rated gauges. Depending on the type of vehicle you drive and the time and location you plan on checking your tire pressure, some of them may be considered a necessity. Whether it is a flashlight, an angle chuck, or even a seat belt cutter, we’ve selected the best specialty gauges with the bells and whistles you might need, for a price you can afford. The McLintech 5 In 1 Tire Pressure Gauge has more bells and whistles than you could possibly imagine, all housed in a compact, portable, easy to hold device. The gauge measures up to 150 PSI, features 2 LED flashlights, and comes equipped with an additional seat belt cutter and window breaking hammer in case of emergency. Weighing only 4.8 ounces, the gauge is a great option for anyone looking for extra safety. Maximum pressure of 150 PSI. This portable gauge can measure up to 150 PSI, making it great for everyday vehicles, as well as heavy-duty vehicles with high pressure tires. Seat Belt Cutter and Safety Hammer. The seat belt cutter and window breaking hammer add an additional layer of safety. Though you hopefully won’t need them, they can make all the difference in a potentially life threatening situation. 2 LED flashlight settings. In addition to a white LED flashlight that will prevent you from fumbling around in the dark, a secondary safety light which points directly at the air valve offers ultimate precision. Easy to hold rubber grip. Weighing 4.8 ounces and featuring an easy to hold, rubber grip, the McLintech 5 In 1 Tire Pressure Gauge is portable and easy to use. Screen only stays lit for 10 seconds. The backlit screen makes it easy to read in the dark, but only stays lit for 10 seconds at a time. The Accutire MS-48B Digital Combination Tire Tread Depth Gauge and Tire Pressure Gauge is a lightweight, compact device that measures your tire pressure up to 99 PSI, while simultaneously measuring your tire’s tread depth from 0-19/32 inches. A built in color bar indicates when your tires are in good shape, and when they need replacing. Reads pressure and tire thread depth. The obvious differentiator with this particular gauge is its ability to measure tire tread depth from 0-19/32 inches. While this may not be a concern for many, it is a great choice for those who lease their vehicles and are required to return it with a particular tread as specified in the lease agreement. Super compact. Weighing only 3 ounces, even with the added features, this is one of the most portable gauges on our list. Measures air pressure up to 99 PSI. For being such a compact device, the Accutire MS-48B can measure tire pressure up to 99 PSI, making it ideal for small and large vehicles. Color bar feature. Not only does the Accutire MS-48B measure tire pressure as well as thread depth, it features a color bar that indicates when the tire needs replacing. No air pressure release. Although you get the added function of measuring your thread depth, you cannot release unwanted pressure while taking a reading.